The Shield is a unique Android device, consisting of a portable Xbox-360-like controller mounted below a five inch touch-screen. The focus here is on gaming, with support for a small selection of titles optimised for the device, as well as the wider Android ecosystem and even streamed titles from gaming PCs. The Shield is also Nvidia’s flagship product for their new Tegra 4 mobile chipset. After a brief delay due to mechanical faults and a $50 drop in price to $299, the Nvidia Shield has finally been released and the reviews have started to roll in. Surprisingly for such an audacious device, the reviews have been quite positive overall. Reviewers at Anandtech, The Verge and Engadget all praised the build quality of the device, although the screen’s relatively low resolution (720p) and sizeable bezels were panned. While portrait mode operation is near impossible and the virtual keyboard is hard to handle, on the whole the design was lauded for its compact nature and its sensible controller layout. For a long time products like the Ouya, Moga Pro and GameKlip have been the strongest Bluetooth gaming controller options, but an integrated system like the Shield is a big step forwards in quality. Games from the Shield Store work as well as you’d expect, and the device excels at playing games with controller support – like emulators and Grand Theft Auto ports. The Shield’s ability to stream PC games from desktops with recent Nvidia cards was also praised, even though the featue is still in beta. Playing Borderlands 2, Lara Croft and other controller-friendly titles works well, with minimal lag or visual degradation when using the fastest available 802.11ac wireless routers. Finally, PC gamers have a comfortable way of gaming on the couch! 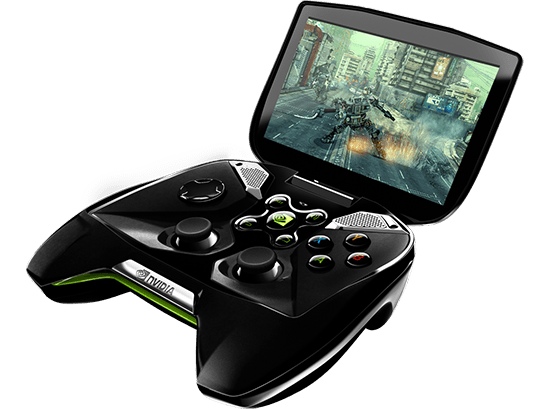 The Nvidia Shield is a niche product that should appeal to gamers, but isn’t as good for general use as a tablet or PC. Regardless, Shield is a bold move from Nvidia that proves the strength of their new Tegra 4 chipset, their hardware design chops and their game streaming technology. Now that the point has been made, I hope we see more of all of these facets of Nvidia as we continue into 2013!